In May 1940 the French Army had more than 800 vehicles of this type, most of which were captured by the German forces. They were widely used by the Wehrmacht to supplement existing armor. Good gun for its tier. Nothing really. 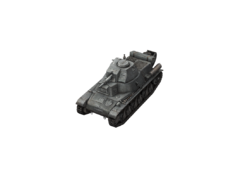 This tank is arguably the best tier 2 tank there is because it’s a MiniMaus! None. This is a premium tank. This page was last modified on 9 August 2017, at 02:20.